Innovation exists in all sectors. We are constantly finding interesting new cases in the food sector. The cronut: the half-croissant and half-donut hybrid, which is taking over the pastry world in NYC. Dominique Ansel is the creator of the Cronut, he said “it has the shape of a donut. The dough is very similar to croissant dough.” Coming from France Dominique was very familiar with croissant making, and only became acquainted with donut in the USA. He was able to add a twist to the American classic pastry. Seems like the perfect fusion for a travelled creator like him. Before finding the winning formula of the Cronut, Dominique had about 10 failed attemps at making this pastry. Like in other fields the perfect creation comes from alot of trial and error. The cronut, is made up of layers of croissant dough, deep fried, filled with vanilla cream (flavor of the month), covered in rose suger and decorated on top with rose glaze. The inside is flaky and light, and the outside crispy and warm. 200 fresh Cronuts are being sold every day, they are becoming the trendiest breakfast, New Yorkers line up early in front of the bakery to taste his hot pastry. The Cronut sells for 5 dollars the piece, and they reportedly sell out of cronuts within the hour of opening. 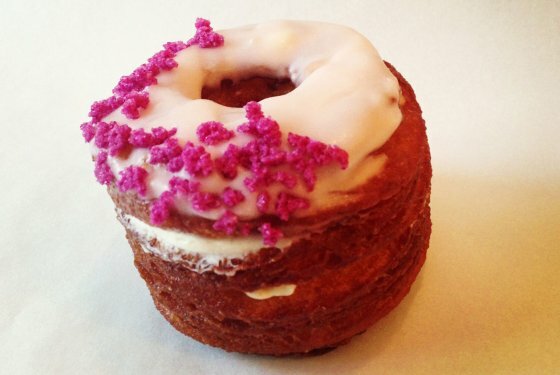 Dominique plans on keeping the Cronut a novelty by adding monthly flavor changes, and other surprises. Some say this might become the new cupcake, but it is yet to see since its elaboration is a bit more intricate for home bakers. Trends come and go, but we hope to see the Cronut in other countries of the world. ABCNEWS.COM – New Yorkers have gone crazy over Chef Dominique Ansels newest creation: the Cronut. via World, meet The Cronut. I am searching high and low to find Cronuts in London !! This entry was posted on May 22, 2013 by mcquant in News and tagged Croissant, Cronut, Donut, Food, NYC, Pastry, restaurants, vanilla cream.